The Betsoft slot Aztec Treasures is a 3D slot packed with features and bonuses. 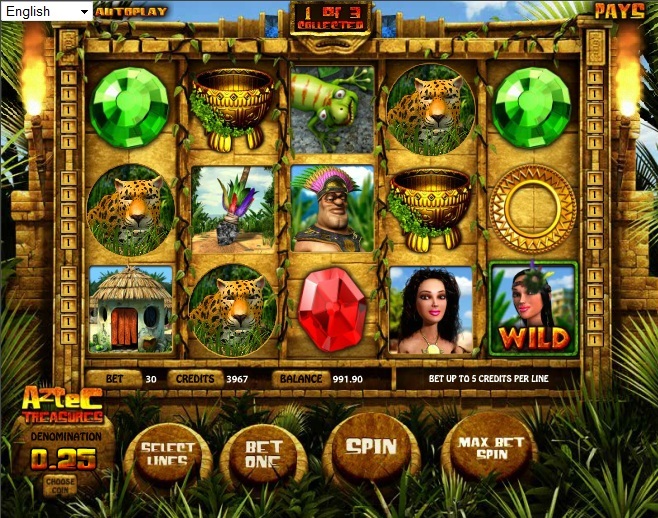 The more you play it the more you discover added extras to this low volatility slot game. Just to clarify, this is a completely different game to RTG’s Aztec’s Treasure, which has a very similar name, but is very much a different game. The Aztec Treasures slot seems to focus on a comical chief of the tribe who spends most of his time throwing around spears, collecting up gem stones and spending time in the love hut with the local woman. 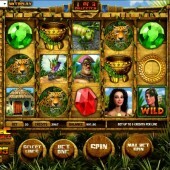 There is a free spins bonus which is awarded when you land 3 or more of the Gecko symbols on a winning pay-line. You are awarded a number of free spins depending on your win, with the added bonus of extra free spins every time you see a gecko on the reels during the feature. The other bonuses are all pick ’em bonuses, which are all triggered in different ways. The funniest of these is the Love Hut Bonus, which is activated by three or more Love Hut symbols on a pay-line. You then pick a gift to give two young scantily clad women before leading them into the love hut. The bonus is measured on how well your gift was received and presumably your performance! The Hidden Gem Bonus is activated when you have collected up all three colored gem stones on the last reel. This usually takes a few spins to achieve, but I find it a very common bonus to get on this slot game. You then go through to a new screen and pick three doorways to reveal prizes. The last bonus is activated by three or more calendar icons (like a big gold coin) appearing on a single pay-line. Pick one to reveal a cash prize, which can be quite big on occasion. There are also other little features to look out for that include Wild reels with 2x multipliers and the spear Wild, when the chief picks up the spear and makes a symbol Wild. Aztec Treasures is packed with features and will appeal to players that like lots of action and plenty of bonuses. For those that prefer to wait for the big rewarding payouts of the high volatility slots, however, the game will unlikely satisfy your tastes. And if you're looking for another slice of Aztec gold, check out Play N Go's Rich Wilde and The Aztec Idols.